The K'NEX sets for the Home listed below have been discontinued, but we include them to assist you if you are thinking of buying one of the sets second hand. 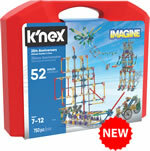 Click here to view the large range of K'NEX sets that we do offer for sale. Celebrate 25 years of K'NEX with this classic building set that includes 750 classic K'NEX rods and connectors, to build anything you can imagine. The enclosed step-by-step colour-coded instruction book showcases 50 unique models of varying size and difficulty. Builders can chose to create a sailing ship, fire truck, light house, and much more! Done building? Use the re-usable plastic storage case, a flashback to the original case design from the early 1990s, to store your K'NEX rods and connectors. Most models can be built one at a time. Building set containing only Classic K'NEX pieces, with instructions to build 30 models, including Clock tower, Rocket, Milk shake, Wheelchair, Buggy, Racing car, Boat ride, Crane, Helicopter, Truck. Airplane, Attack chopper, Box truck, Butterfly, Catamaran, Cement mixer, Clapping monkey, Classic car, Coconut tree, Dancing ballerina, Dragster, Dump truck, Excavator, Ferris wheel, Fish, Go-kart, Gymnast, Ice cream cone, Jet, News van, Off road rover, Plane, Racer, Rocket ship, Scrambler, Skier, Submarine, Suspension truck, Swing ride, Swing set, Telephone, Tyrannosaurus, UFO, Unicyclist, Wheelerbot. Please note that many of the models in this set are built using Micro K'NEX pieces, which means they are smaller than models built using Classic K'NEX pieces. A popular 350pc tub containing lots of Micro K'NEX and K'NEX brick parts, which can build 20 models from instructions, including various cars and bikes, a plane, a boat, an insect, a spaceship, a dinosaur, a swing ride and a ferris wheel. The instruction leaflet provides building instructions for 5 different models, with detailed instructions for a further 15 models available as online downloads. The sturdy storage tub encourages tidying up, and is large enough to store even partially built models. 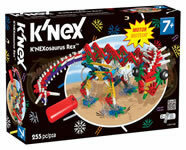 One of the original K'NEX building sets, this set replicates everything that K'NEX stands for. This is also an excellent set if you want to build motorised K'NEX models to your own design. Use Classic K'NEX pieces to build a 4 Wheel Drive Truck with lights and all-wheel steering, to handle the toughest terrain. Then download instructions to build a pick-up truck and a dune buggy. Light bar uses 3 button batteries (included). Build twice the fun with the gigantic 1.8m (6ft) Double Ferris Wheel building set. With 2,375 colourful parts, this Ferris Wheel offers a true builder's challenge. Follow the colour-coded instructions to build the towering model one piece at a time, for hours of building fun. Then switch on the powerful, mains-powered 12v motor and watch the brightly coloured star-shaped wheels spin in opposite directions. A large tub containing 700 classic K'NEX parts, which can build 50 models. This set has now been replaced by the Classic K'NEX 70-model chest. This 618-pc set contains instructions for 52 unique models - 1 for each week of the year! Includes a robust plastic storage tub. 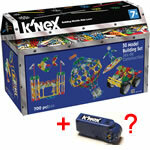 Our most popular K'NEX set! Ideal for home or school. 4 wheeler, Airboat, Anchor, ATV, BBQ grill, Boombox, Buoy, Cabana, Camera, Catamaran, Clamming rake, Clamming rake, Cooler, Crab, Dolphin, Fish, Fishing boat, Fishing pole, Go kart, Golf cart, Hammock, Hang glider, Helicopter, High diver, Horse, Hot air balloon, Ice cream cart, Inner tube, Jellyfish, Jet boat, Jet ski, Jungle Gym, Lifeguard stand, Lighthouse, Lobster, Megaphone, Metal detector, Muscle car, Octopus, Pail, Palm tree, Pelican, Pick-up truck, Picnic basket, Picture frame, Rally car, Rescue truck, Rowing boat, RV Camper, Sandcastle, Sea plane, Seagull, Seahorse, Shark, Shovel, Snack shack, Speedboat, Starfish, Stingray, Submarine, Sun chair, Surfer, Swordfish, Treasure chest, Trident, Turtle, Water skier, Waverunner, Whale, Wind surfer. Please note that the set is shipped in a cardboard box only, not in the green storage chest which comes with the 70-model set. The set also offers a comprehensive set of parts with which to design and build your own K'NEX models. Collect & Build this space-themed roller coaster - the Amazin' 8 Coaster. Motorized for exciting performance that sends the car up the chain lift and spiralling through the figure-of-8 track. Stands 0.81m (2.6 ft) high. Build a classic, nostalgic K'NEX model just like you remember with the 20th Anniversary Big Ball Factory. Over 3,100 Classic K'NEX pieces complete this gigantic ball machine that stands over 1.2m (4 feet) high. Watch as the 4 balls travel down 5 different paths - which way will the ball go next? Just turn the motor on and watch it go! Requires 2 "AA" batteries (not included). Perfect for advanced builders from 12 to 99. Build 10 different models of city vehicles. Includes working lights, which activate when you move a model. Build a K'NEX roller coaster that stands over 1.5 feet (45cm) tall! Motorized for exciting performance that sends the car up the chain lift and spiralling through track. This set comes with over 300 parts, including Micro K'NEX rods & connectors, track and a motor. Requires 2 "AA" batteries, not included. Click on the Video link below to view a short video that includes this set (watch out for the coaster with the orange track!). Build with K'NEX pieces like rods, connectors and track. Use the rubberband powered sling-shot launcher to send the silver coaster car twisting and turning through over 5m (18 feet) of swirling, non-stop action! Or download exclusive instructions to build an incredible second model, the Torpedo Twist coaster. Build Dinosaurs that Roar and Stomp! The K'NEX Dinosaurs 20 Model Building Set is packed with 334 Micro K'NEX and K'NEX brick parts to build a T-Rex, Brontosaurus, Pterodactyl and more. Then bring them to life with the motion-activated sound brick! Build one of the most iconic thrill rides from Disney's world-famous theme parks - Dumbo the Flying Elephant! The finished ride is more than 60cm (2 feet) wide. Easy-to-follow step-by-step building instructions, and a convenient suitcase-style case for storage. Two coaster cars equal double the trouble with the Double Doom Roller Coaster Building Set! Build with classic K 'NEX rods, connectors, and track that build a model over 0.78m (3 feet) high. With the motorized action, your 2 coaster cars will go on a twisting and turning ride. For even more fun, download instructions for a second model, the Wild Warp coaster. Models can be built one at a time. A motor is included, which drives the wheel round. Requires 2 "AA" batteries (not included). Take on the ultimate K'NEX building challenge with the Grandfather Clock building set. With over 9,000 classic K'NEX parts and standing over 1.8m (6ft tall), the Grandfather Clock is the LARGEST K'NEX set ever created. Follow the colour-coded instructions for hours of building fun. The Grandfather Clock is a real working clock, with moving hands, a swinging pendulum and sound chimes. Includes a mains-powered 12v motor, and a battery-powered motor. Requires 3 "AA" batteries (not included). Buzz into action with the K'NEX Hornet Swarm Roller Coaster! Build a motorized, moving roller coaster that stands up to 81cm (2.7 feet) tall, using easy-to-follow, step-by-step building instructions. The set includes a motor, chain lift, coaster car and over 5 metres (19 feet) of track. An alternative coaster design can also be built, from dowloadable instructions. Motor requires 2 "AA" batteries, not included. This amazing roller coaster set includes a car that records video footage as it flies around the 5m-long track! Or you can record fly-by video of a car racing round the track, from any one of six fixed vantage points on the roller coaster. Footage can then easily be downloaded to a computer using the USB cable supplied, and shared with friends. Blast off faster than the speed of light with the Hyperspeed Hangtime Roller Coaster Building Set! Build a Roller Coaster over 1.7m (2.5 feet) high. The exclusive inverted blaster motor launches your hanging coaster car on an out-of-this-world adventure through 18 feet of track. For more fun, download instructions for a 2nd coaster. Requires 3 "C" batteries (not included). Introducing a new take on a K'NEX classic...the Light-Up Ferris Wheel building set. Standing over 3 feet high with 19+ feet of twisting, turning track, the motorized Loopin' Lightning provides a building experience that's just as thrilling as it's performance. A low-cost K'NEX mini dragster. Packed individually (as parts) in bags, with a label showing the finished model. Colours of parts may vary from those shown. An ideal mini set for all ages from 7 to adult. A strong K'NEX mini bridge at low cost. Packed individually (as parts) in bags, with a label showing the finished model. An ideal mini set for all ages from 9 to adult. Multiple sets can be joined together to make a longer bridge (eg as a team-building exercise). Collect & build RAZOR, number 1 of 4 in the Moto-Bots Series. This set is motorised, so Razor can walk and move his hands. He comes with 389 rods, connectors, bricks, specialty parts and black and yellow eyes. Build the lead model, or combine Razor with Chomp to build a working Battle Bot! Each set sold separately. Requires 2 "AA" batteries, not included. 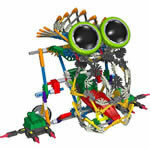 Collect & build the amazing SPIDER, number 4 of 4 in the K'NEX Moto-Bots series. This set is motorised, so Spider can crawl and move his eyes. He comes with 373 rods, connectors, bricks, specialty parts and black and red eyes. Popular classic K'NEX set, with instructions to build two large dinosaur models, a K'NEXosaurus Rex and a Megasaurus. Each models is brought to life by a K'NEX motor (requires 2 x AA battery, not included). 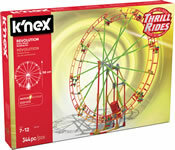 The K'NEX Revolution Ferris Wheel building set lets you and your children experience interactive fun while operating your very own amusement ride. The set contains colourful rods and connectors designed to create a scale-model Ferris wheel that's almost 2 feet (58cm) tall. The pieces can attach and detach from one another easily, making it fun to assemble. This building set features a battery-powered motor that spins the ride in either direction using authentic, rail-driven rotation, just like a real Ferris Wheel! In response to overwhelming requests for a large classic-style K'NEX Coaster, K'NEX is celebrating its 20th Anniversary and its fans with the Son of Serpent Coaster. This HUGE model is built from 5,500 Classic-K'NEX pieces, including rods, connectors, and 16m (53 feet) of original tube-style track. Measuring 2.4m x 1.5m x 1.8m (8ft x 5ft x 6ft) and including three K'NEX motors and speakers for your MP3 player, this enormous coaster sends five sleek cars filled with K'NEXmen figures hurtling down the track, around tight curves, and through gravity-defying loops. Intended for serious builders, the Son of Serpent coaster is an unforgettable way to celebrate your passion for roller coasters and classic K'NEX building sets. Build the K'NEX Sonic Blizzard Coaster, and combine motorised motorized roller coaster excitement with exhilarating head-to-head racing. Build a spellbinding K'NEX coaster classic, and send the K'NEXmen figures in their three coaster cars hurtling through over 7m (23 feet) of track. Includes 1300 classic K'NEX parts & pieces, including rods, connectors and original tube-style track. Collect & Build this space-themed roller coaster - the Star Shooter Coaster. Motorized for exciting performance that sends the car up the chain lift and spiralling through the tortuous track. Stands 1m (3.3 ft) high. Requires 2 "AA" batteries, not included. Build the superb K'NEX Super Cyclone Coaster, the roller coaster building set that stands 82cm (2.7ft) tall with over 5m (16ft) of twisting, turning track. Follow the colour-coded instructions to build this exciting ride, step-by-step. Then switch the motor on to bring the model to life. The motorized chain lift carries the car to the top. As it crests the peak, the car accelerates through a series of twists, turns, curves and loops. Instructions for a second dynamic model the Tempest Twister are available online. Requires 2 "AA" batteries (not included). Get ready for an intergalactic adventure with the Supernova Blast roller coaster building set. 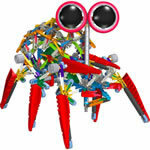 Use over 800 K'NEX pieces including flexi-rods to build a model over 0.95m (3 feet) high. The specialized blaster motor launches your car on an out-of-this-world adventure through 6.7m (22 feet) of glow-in-the-dark track. Also download instructions for a 2nd coaster, the Sonic Boom. Build a K'NEX coaster classic - the K'NEX Thunderbolt Strike roller coaster. You can build with all-classic K'NEX parts including rods, connectors and original tube style track to create this motorised roller coaster that sends the cars and 2 K'NEXmen figures hurtling down 5m (17 feet) of track. The completed coaster is 1.6m (5.3 feet) long and 0.95m (3.1 feet) high. Your Top Gear Challenge: Build an attack copter with foam missile launcher and then set it off on a mission to seek and destroy the off-roader that you just created. Vehicles have Stig and pilot figures, and copter comes with three foam darts for maximum firepower. 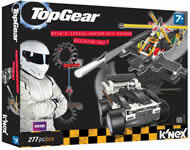 The instruction book includes step-by-step building instructions for the copter and off-roader, and instructions for Stig's plane can also be downloaded. Build 10 farm-related models, including tractor and trailer, truck, combine harvester, windmill, mower, barn, crop duster and farmer's garden. Use Classic K'NEX pieces to build an amazing Transport Chopper with motorised blades. Then download instructions to build a historic biplane, and a rescue helicopter, both with working propellers. 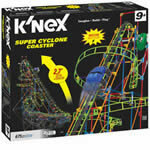 This is one web you'll want to get caught in - the K'NEX Web Weaver Roller Coaster Building Set! Use the included parts and pieces to send the unique air-propelled coaster car through horizontal and vertical thrills. Once done building, turn off the lights - this coaster glows-in-the-dark! Set includes over 430 K'NEX parts and pieces, including rods, connectors, glow-in-the dark track and an air-propelled coaster car. Additionally, builders can download instructions for a second roller coaster model. The ideal set for younger children who love building models. The colourful, chunky Kid K'NEX blocks, rods and connectors are easy to stack and snap together, to build anything your child can imagine. Models to build: Sailing boat, robot, cat, fish, table, chair, plane, chicken, letter A, letter B, letter C.
Your child can build one of Sesame Street's most loveable - and hungriest - characters, Cookie Monster, getting some exercise by hitting the basketball court! Includes a "Play & Learn" activity sheet filled with collaborative and educational fun for parent and child plus additional building ideas. Build and then play with Cookie Monster! A great introductory Sesame Street building experience. Includes 3 parts to build Cookie Monster plus a "Play & Learn" activity sheet. Build Sesame Street's friendliest red monster, Elmo! This creative building set includes a "Play & Learn" activity sheet filled with collaborative fun for parent and child plus additional building ideas. Your child can build Sesame Street's coolest red monster, Elmo, getting ready to kick his football! 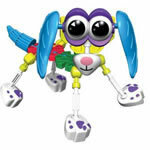 Build any one of five cute puppies with this popular Kid K'NEX set! Your child can build Sesame Street's friendliest resident, Ernie, dressed in his bathing suit and ready to take a swim!